Another very long day in El Salvador! We expected that today would be a short day. Our schedule called for completing the well and presenting it to the people of Valle Nuevo sometime around noon. However, things did not go according to schedule. Although we completed the well, we could not get any water to the surface no matter how much we pumped. We worked past the lunch hour trying to solve the problem but still no water. Something was clearly wrong. Our first plan of action called for checking the pump. That meant pulling out the 200-feet of steel rods connected to the pump. Pump looked fine. The next step was to pull out the 200-feet of pipe housing the pump stuff. Hard work. But, that’s when we found the problem. One of the sections of pipe about 150-feet below the surface had broken. Once we replaced that piece and reinstalled everything, we were finally able to pump water to the surface to the cheers of the villagers. 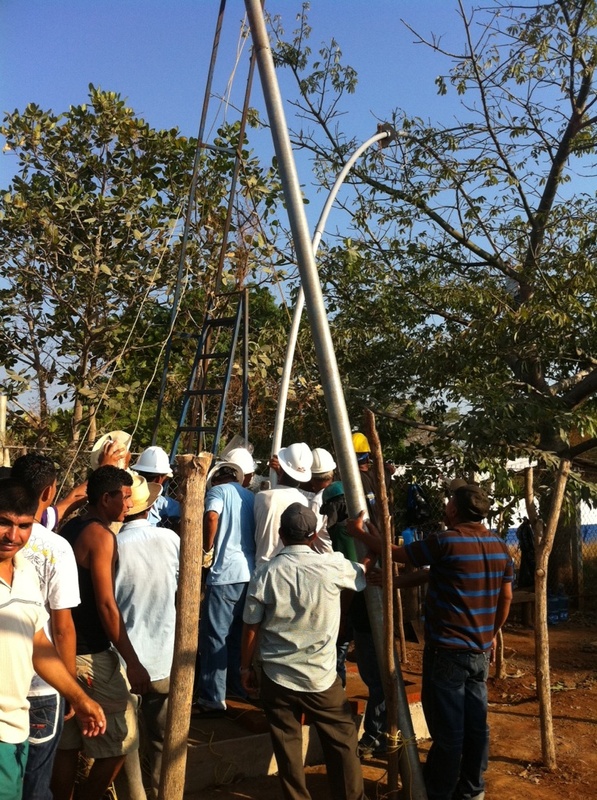 We finally dedicated and presented the water well to the people of Valle Nuevo at around 6:30 PM. What a sweet time. The school children presented us with gifts they had made in class and the village leaders thanked us. One old man approached the microphone and asked to speak. “I have no words,” he said, “to thank our friends who have traveled so far to give us this special gift.” Afterward he made it a point to hug each of us as we stood around the water well one last time. The best part of the day for me was working shoulder-to-shoulder with the men of the village. They were as concerned as we were that we solve the mystery of why we could not pump water to the surface. We worked together all through the afternoon heat until the problem was solved. This water well means so much to these folks that no one even gave a thought of taking a break. I have no words to describe the intensity of the fellowship we shared as we worked toward a common goal. I am happy that we completed our task and successfully drilled our eleventh water well in Central America with our partners at Living Water International. We have two more teams scheduled to drill water wells later this year. I can hardly wait to meet the people we will serve and bless with the gift of water and the Word. You give these thirsty people real, clean water, where it is needed so badly. Surely that makes them more receptive when you offer them the Living Water. God bless you, may each well you drill flow sweet and clean, and may the Living Water forever flow in the hearts of the people you serve. Thanks, Lanni, for sharing the story about Pastor Baker. What a great man of God. Thanks for following our adventure in El Salvador.